This is really a pretty fascinating book. It could be classified as a science fiction thriller with the kind of excitement that makes you keep wanting to turn the next page to see what happens next even if you do have responsibilities that must be attended. A biotech scientist does some bioengineering on his own lymphocytes and somehow endows them with high intelligence. Yes, they are individual cells that are each and every one self aware and conscious. When he injects them back into himself they set up a civilization in his body. Imagine many many millions of fully conscious intelligent creatures in a person's body communicating with one another and sharing what they learn. Well, it doesn't take long until they start performing a bit of bioengineering of their own on the scientist's body. Then when they migrate out of his body and start colonizing the surrounding world the real fun starts. They reproduce until they number about a trillion billion individuals. The two small words trillion billion represent a number that is actually hard, if not impossible, to grasp, but imagine that many many individual intelligences communicating and collaborating with each other and imagine them being curious about the nature of the universe around them. I suppose you can guess that humanity is left in the dust. The word dust can be read as perhaps a bit more than metaphorical too. 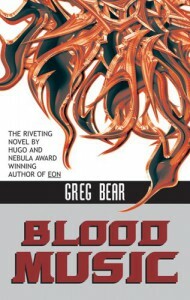 It is unfortunate that Greg Bear was unable to convey what their motives become and what they are up to, but, really, could any writer do that? He is good, though, at conveying the utter strangeness that us mere human intelligences would make of what they would do. Try this book out. The implications are amazing. I will add, though, that the book is a little outdated. At the time of the writing there was a lot of concern in the news about the supposed dangers of bioengineering and I am sure that Bear had that in mind while he was writing. If he was writing it now he would probably make his lymphocytes nanobots instead. Also, the World Trade Center plays a prominent role in the story. Well, I'm sure you know what happened to that. However, don't let its age disuade you from reading this page turner.